Pro-Trump congressman Ron DeSantis, a noted Israel supporter, defeats Tallahassee Mayor Andrew Gillum in Florida gubernatorial race. Congressman Ron DeSantis was elected Governor of Florida Tuesday, defeating Tallahassee Mayor Andrew Gillum by roughly one percent. DeSantis, the 40-year-old Republican currently representing Florida’s 6th Congressional District in the US House of Representatives, defeated Tallahassee’s 39-year-old first-term mayor in a race Gillum had led for much of the summer according to polls, but was ranked too-close-to call on the eve of the election. The unofficial results with 100% of precincts reporting is 49.9% for DeSantis, 48.9% for Gillum, and 0.6% for Reform Party candidate Darcy Richardson. With DeSantis’ win, the GOP retains control over the Florida governorship, currently held by Republican Rick Scott. Senator-elect Scott narrowly defeated incumbent Democratic US Senator Bill Nelson, 50.3% to 49.7% on Tuesday. Strongly backed by President Donald Trump, DeSantis defeated Florida agriculture commissioner Adam Putnam in the GOP primary in August. 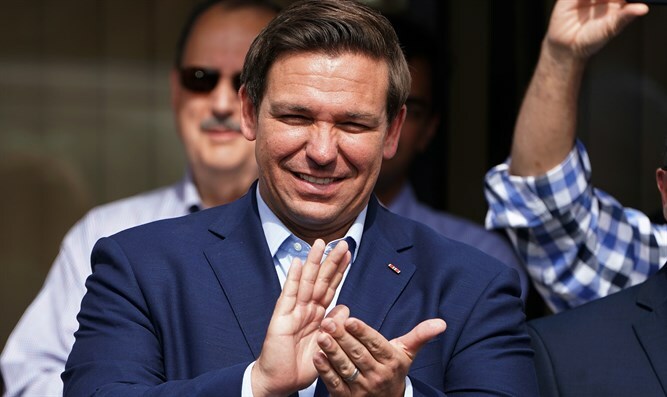 A long-time supporter of Israel, DeSantis sponsored the 2013 Palestinian Accountability Act which called for the withholding of US aid to the Palestinian Authority until the PA officially recognizes Israel as a Jewish state and cuts ties with the Gaza-based terror group Hamas. DeSantis promoted the relocation of the US embassy in Israel from Tel Aviv to the capital, Jerusalem, saying that Americans were “excited to see the embassy move”. “Israel is our strongest ally in the Middle East, as we share common national interests and possess similar national values. Israel is not the problem in the Middle East; it is the solution to many of the problems that bedevil the region. American policy must ensure that Israel emerges victorious against those who deny or threaten her existence,” DeSantis said. Earlier this year, DeSantis drafted a proposal calling on the US to recognize the Golan Heights as an ‘integral part’ of the State of Israel. Israel annexed the Golan in 1981 – a move the US has never recognized. Gillum drew criticism from conservative backers of Israel during the race, who pointed to support he received from the group ‘Dream Defenders’, which backs the anti-Israel Boycott, Divestment and Sanctions movement. In a June 30th interview, Gillum criticized Israel’s military response to Hamas rocket attacks on Israeli targets. Israel’s response was “outside to the threat,” Gillum claimed. The Tallahassee mayor also hit President Trump’s decision to relocate the US embassy in Israel from Tel Aviv to Jerusalem, calling it a “provocation by the president that was unnecessary”. When an interviewer described Israel’s killing of Gaza terrorists attempting to breach the Israeli border as “murder”, Gillum said he condemned “murder on all sides”. During the campaign, DeSantis highlighted Gillum’s statements on Israel, saying the Democratic candidate supported the partition of Jerusalem. “I was happy to be there when the embassy was unveiled. Andrew Gillum just recently says that he opposes having our embassy in Jerusalem. I think he believes Jerusalem should be divided,” DeSantis told reporters during the campaign. Gillum pushed back against criticism over his comments, citing his three visits to the Jewish state, and stated that he was opposed to the anti-Israel BDS movement.